Dad’s Army is rightly regarded as one of the most important sitcoms ever made or broadcast in the UK. The series ran for almost a decade, amounting to 80 episodes, and at its peak reached audiences that modern-day programme makers can only dream of. But, more than cold statistics, the series has become a deeply loved part of British culture and heritage and has added many catch-phrases to the language. It is no surprise that, since the end of the programme in 1977, references to it have cropped-up in later works. We are not talking here, about the many spin-offs such as the film or stage show, but more oblique references in entirely separate works. We thought it would be good to collate a list of as many of these as possible. We have made a start here, but if you know of any we have missed then please leave a comment to let us know. 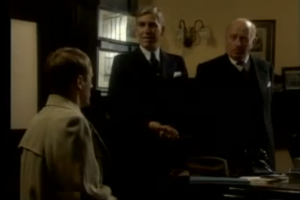 Good night Sweetheart – less subtle this one and better known: in the episode Don’t Get Around Much Any More of the time-travelling comedy, Gary Sparrow visits a wartime bank and meets by a manager and chief clerk who bear uncanny resemblances to Mainwaring and Wilson. Indeed Gary spots the similarity and has trouble taking them seriously. Doctor Who – with two such long running much loved series as these there must be some connections. Well let’s skip over such things as Jon Pertwee being cousin to ARP Warden Bill Pertwee and being considered for the role of Mainwaring; or Phillip Madoc, Talfryn Thomas and several others appearing in both. There is a more recent tribute in the Matt Smith episode Victory of the Daleks, set in Churchill’s bunker in wartime London. The central character, Professor Bracewell (Bill Patterson), shares his name with the minor character Thomas Bracewell, played by John Ringham in the first episode The Man and the Hour. Okay, so that could be coincidence, but later in the same episode when the Doctor is on the roof observing the Spitfire attack an ARP warden repeats Warden Hodges’ catchphrase, ‘put that light out!’ Putting those two references together with the wartime setting we are convinced that writer Mark Gatiss was deliberately paying a tribute to Dad’s Army. Mortal Kombat – according to Wikipedia, the Sega Mega-CD version of the arcade game has a cheat code enabling users to change the names of the characters from the game to those of the Dad’s Army characters. If you know of other Dad’s Army references that we have missed please let us know through the comments section below and will add them to the master-list giving you full credit. This entry was posted in blog on November 21, 2012 by wolAdmin. Fairly well known are Foundry Miniatures 28mm British Home Guard Heroes war gaming figures. See their web page for images.